THIS VEGAS4LOCALS.COM COUPON MAY BE USED BY ANYONE, REGARDLESS OF RESIDENCY! Dubbed the “Rock Star of Hypnosis” due to his fast-paced energy, Kevin is one of the highest rated performers in Las Vegas. 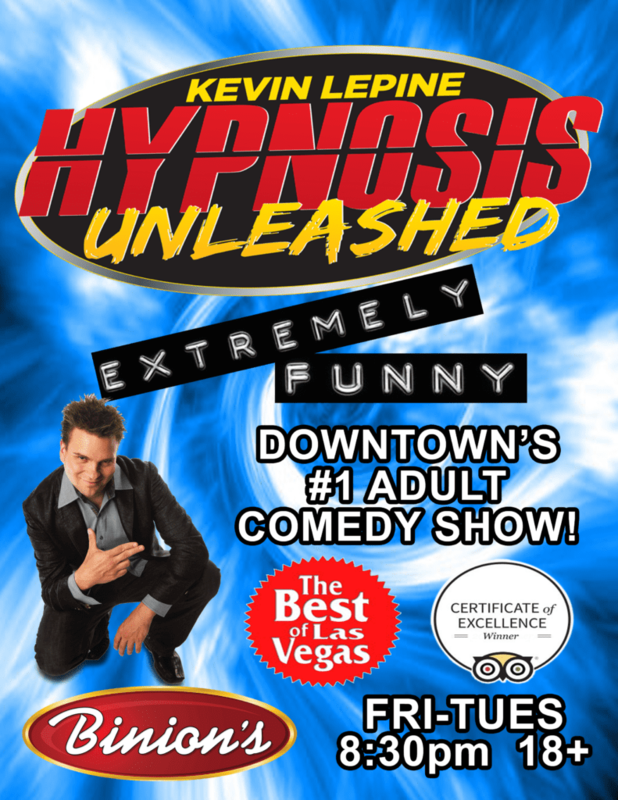 2 Time Best of Vegas Winner, Kevin Levine’s Hypnosis Unleashed infuses fast-paced hypnosis with stand-up comedy, razor-sharp wit and genuine compassion. Kevin’s volunteers never feel uncomfortable or embarrassed – instead, he makes them feel like stars! Get hypnotized or watch your friends become the show! Recommended Age: 18+ (adult language). Parking is free for show guests with validation at the box office.